The Rolling Stones have wrapped the U.S. leg of their “50 & Counting” world tour with grandMA2 consoles along for the still-wild ride. 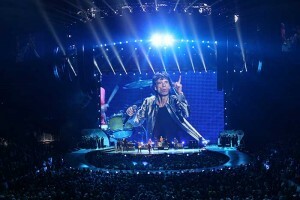 The Stones sell-out 50th anniversary tour is their first in six years. They opened the U.S. leg in LA and concluded their 18 dates in Washington, D.C. The legendary band performed on a stage set featuring a giant set of psychedelic lips and a tongue-shaped walkway that riffed on their iconic logo. Patrick Woodroffe was the lighting designer and Ethan Weber the co-lighting director. Weber and programmer/co-lighting director Dave Hill manned two grandMA2 full-size consoles, networked together, for the tour. “We love them,” says Weber. “I handled the key lighting on one console and Dave ran the bulk of the system off the other.” Both men are veteran Stones lighting directors with Hill having programmed every tour since Steel Wheels. And both are veteran MA users. Upstaging supplied the lighting equipment.